Last week I was very pleased to invite Lesley of Sewniptuck, Marianna of Sew2Pro and one of my very kind followers Sheree round for dinner. Lesley lives in Sydney but was over here for a little while and I was so happy she could come round, despite her busy schedule. Sheree kindly came over from Essex (bearing sports socks for each of us – how kind), and dear Marianna cancelled her normal Monday night commitment to be there. We had a special meal together and spent a little while talking about sewing and blogging. But we also had some fun analysing our figures. Marianna provided white pattern paper, and I located felt tip pens, a set square and some blue tac. We stuck the paper to the wall and then stood against it, chin up, and one of the others traced around our outline. It is more difficult than it looks. I wore a tight T shirt and my tights. And luckily Lesley told me she was a trained midwife just as her pen traced around my inside leg. 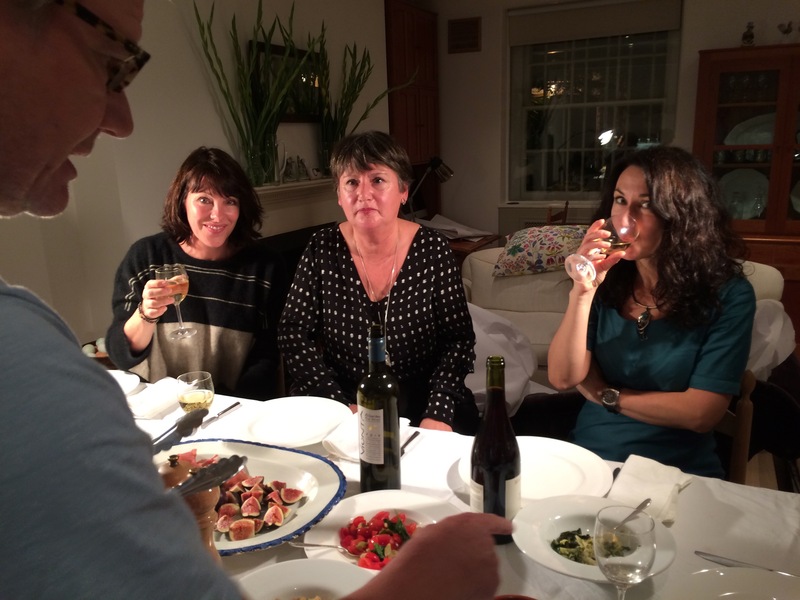 As you can imagine four women and two bottles of wine can lead to some funny conversations. Once you have traced your outline, mark the top of the head, the necklace line, the underarms, the shoulder, the waist, hips and knees. Using the yardstick draw lines across the drawing at all the above points. Connect the shoulder dots to the hip dots using the straight edge. Then fold the paper in half (horizontally) so the top of the head comes to the feet. Then fold in half again creating a second crease. 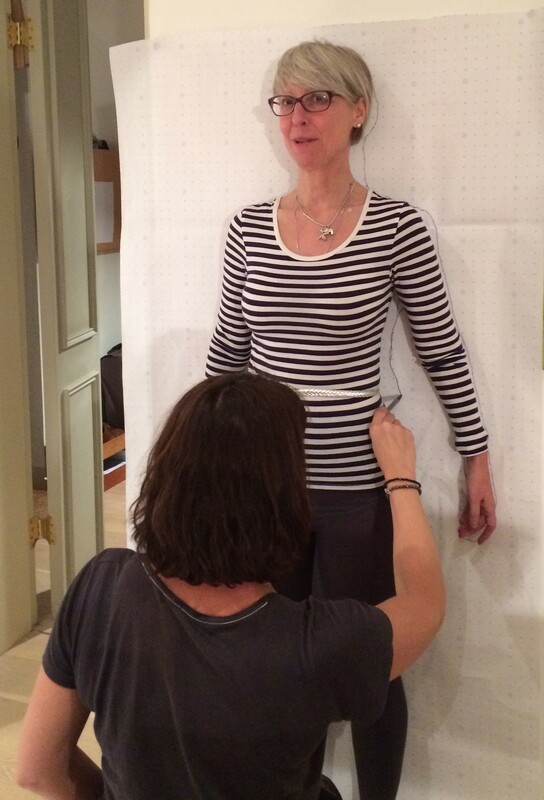 If you are “long waisted” the waist is below the halfway point (between underarm and hip). Your legs are comparatively short. If you are “short waisted” your waist comes above the halfway point (between underarm and hip). Your legs are comparatively long. If your shoulders and hips are more or less the same size, and you have a narrow waist you would be shaped or hour glass. Most women fall into this category (all four of us did). If your shoulders and hips are more or less the same size, but your waist is not clearly indented you have a semi-straight figure. The straight figure has shoulders that are markedly wider than the hips. The basic shape of your figure will determine which fashions and shapes you might choose to look your best. The book has rather dated illustrations. We probably should have stepped in to our coloured spandex leotards and shiny tights (where are the leg warmers, by the way?) Marianna said we all looked like the subject of police enquiries once our images were laid out on the floor. All in the interests of better fit. This is a helpful process because most commercial patterns are manufactured assuming the “average” proportions and attributes. If you are bigger or smaller, fuller or flatter, then you may have to adjust the pattern to get a good fit. Overall I would say this is an experience worth trying. That was a fun night indeed (thank you). I didn’t get round to writing about it before I went away but I have a lovely photo of you pinning Lesley to the wall! This does look very entertaining – but also interesting. I’m not sure I could face seeing what I look like in outline! A great idea for a get together. I had David do this for me, following the Palmer Pletsch book. I hadn’t realised previously just how lop sided I am! I always have the dilemma of whether to cut different right and left sides or try to use the same pattern and alter in fabric, though not overfit of course, as that emphasizes discrepancies. .
I’ve done this before and learned a lot! It’s not for the faint of heart, though. Sounds like .. er, fun. I think I’d need a sideways version. Very CSI! It looks like you all had fun, and gained some useful information too. Looks like a fun time you had. Glad it was useful. Isn’t Lesley lovely? Thanks for the explanation of long-waisted and short-waisted as I have never understood how you know which you are. I will be doing a crime scene drawing session shortly! Lesley is lovely – and so is Marianna and Sheree. I couldn’t have had a nicer group of ladies round. 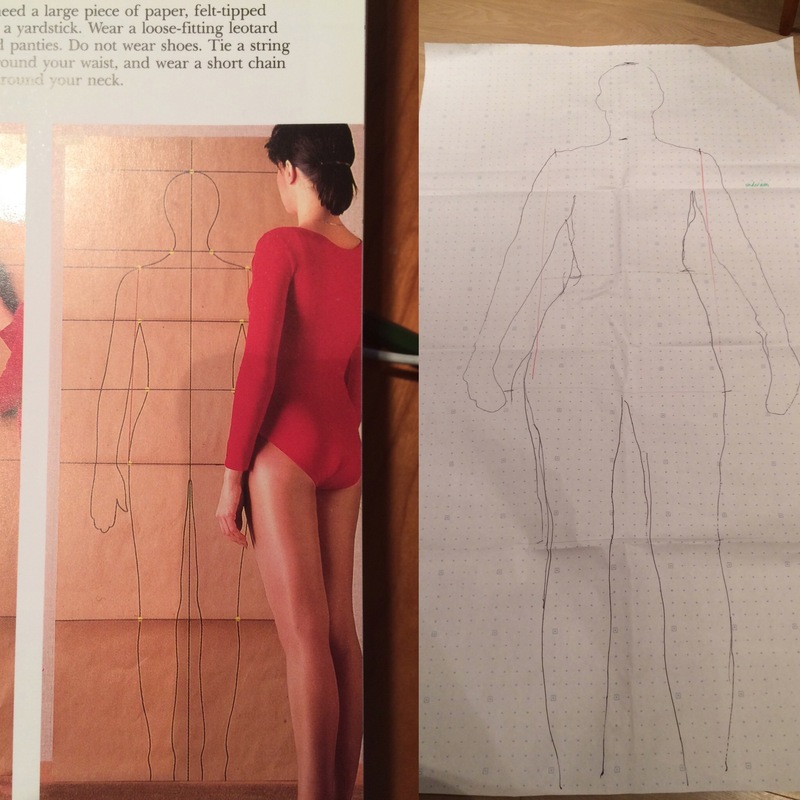 I have done the outline years ago, I forgot what I learnt from the exercise. Guess I should do it again. So much easier with sewing friends who can help, than a husband who thinks it is a waste of time. Sorry for the late reply, Kate. Having been away, I have some catching up on my blog reading – especially yours – as we all know what a prolific writer you are. Scrolling through your posts, the photo of Lesley, Marianna and I stood out. I had to smile at my expression. Looking in awe at Nick! Well, much deserved though, a beautiful (and very tasty) spread of food. Thanks so much. I’ve met Leslie too – we share a pattern making teacher. Looks like you had fun. Sorry, just got to this, its been maaaad since I arrived home last week. Thanks for the terrific evening Kate, lovely to have meet you, Sheree and Marianna at long last; lovely ladies all, and I’ve worn my socks lots! Thanks to Nick for his inspired catering and of course to you for organising the ‘crime scene investigations’! A note for anyone contemplating this strategy. If you have a less than willing helper, I do think it would be enough to mark with a + centre head, shoulders, waist sides, hip sides, knee centres and floor level. Draw vertical and horizontal lines after they’ve gone back to watching TV. That way you can clearly see where your a/symmetry lies. You won’t get the entire outline, but that can be misleading anyway depending on the art experience of your scribe!!! It was my pleasure dear Lesley!